We finally got some snow. 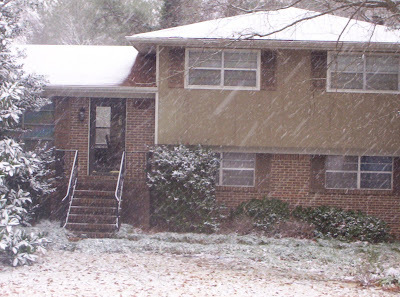 We have been in our house for over 4 years and this was our first time to see any kind of winter weather. Heath has been sick since Wednesday with swollen tonsils and a bad head cold. Steven worked this morning but me and Seth got to play in the snow as it came down. 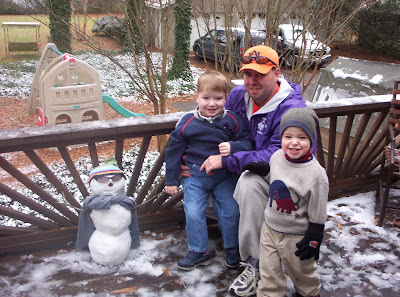 But, when Steven got home from work-Seth helped him build a snowman. Heath watched from the back door. I'm not sure you can call it a snowman but regardless-this is our first family snowman. Heath and Seth over at Susu & Papaw's on Christmas Day. We had to get a picture of their matching vests from their great grandmother and grandfather from Florida.